Weightlifting is a type of strength-training exercise that burns calories and fat and tones and builds muscle. While you can lose weight by lifting weights, this type of exercise tends to build muscle, which, depending on how much muscle mass you accumulate, can weigh more than fat. This means you could watch fat disappear from your face, belly, buttocks and legs, but may not see a difference on the scale. One pound of fat is equivalent to 3,500 calories. If you burn 250 to 500 calories a day, you could potentially drop 0.5 to 1 pound a week. 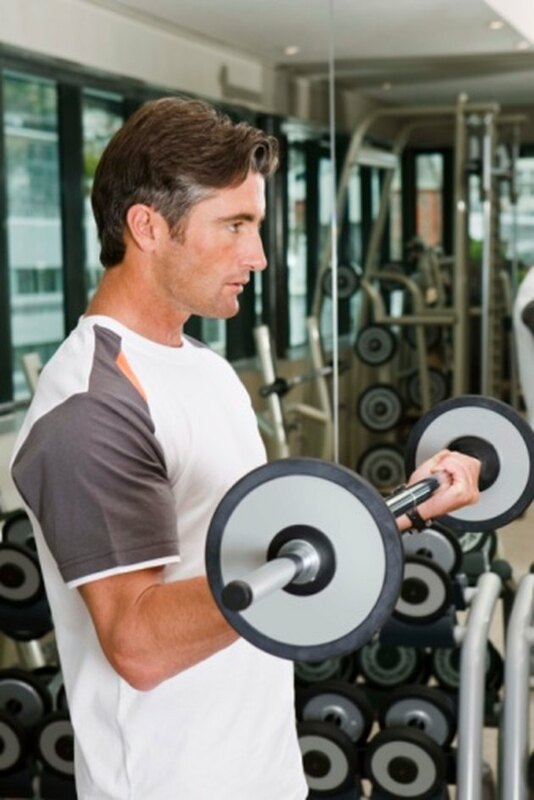 According to Harvard Health, a 155-pound person can burn 224 calories after 60 minutes of lifting free weights. A 185-pound person can burn 266. The number of calories burned, after one week of weightlifting for 60 minutes, could result in weight loss of 2 pounds a month. You will burn more calories in a shorter amount of time by combining weightlifting with cardiovascular exercise in a circuit weight training routine. Circuit training is characterized by doing several resistance-training exercises interspersed with short, intense bursts of aerobic activity with little to no rest between exercises. A circuit training routine should last about 20 to 30 minutes. Harvard Health Publications reports that a 125-pound person can burn 240 calories after 30 minutes of circuit training, more than twice as many calories than from weight lifting alone. A 155-pound person can burn 298 calories after a half hour of circuit training and a 185-pound person can burn 355 calories. An average of 297 calories burned in 30 minutes amounts to a loss of 2.5 pounds. after one month. Weight training along with cutting calorie intake and eating a low-fat diet can lead to dropping a more significant amount of weight. A person who burns 500 calories a day through weight training exercises and slashes 500 calories every day from his diet can see a 2-pound reduction in weight after just one week. The American Academy of Family Physicians reports that healthy adults should limit their weight loss to 2 pounds. a week. About two-thirds of adults in the United States are overweight or obese, according to the Weight-control Information Network. By reducing your weight through exercise, you can prevent weight gain as well as reduce your chance of developing a potentially life-threatening chronic illness such as heart disease, Type 2 diabetes and certain types of cancer. Do eight to 10 strength-training exercises with eight to 12 repetitions at least twice a week as well as a regular aerobic workout.